Constantly struggling to find room in your fridge for wine bottles? If your fridge is anything like mine, most of the shelves are not tall enough, and the ones in the door are usually filled up. Wine bottles end up on their side, inevitably rolling around inconsiderately knocking every thing else out of the way. I prefer to give my wine its own space for a more harmonious inner fridge. 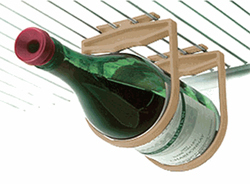 Wine bottles need space and Hold Ups Refrigerator Wine Rack can provide it. Slide the gizmo through the wire shelves in your fridge and twist to install. Suddenly, the contents of your refrigerator are transformed from an unruly mob into upright model denizens (or horizontal, in this case).